Kohlrabi spears cured in a dill brine. 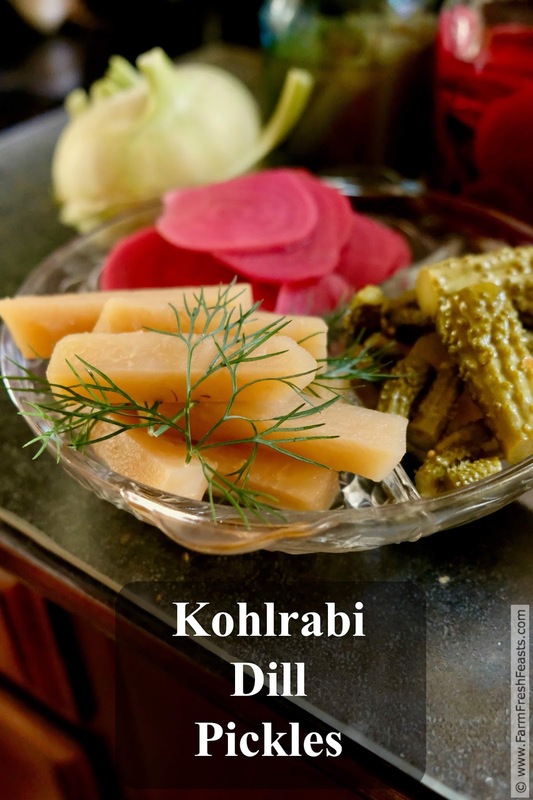 Like a kosher dill pickle, but using kohlrabi instead of cucumber. Do try this one at home! Conventional wisdom says that the more repeated exposures children have to new foods, the more they are likely to grow to like the new foods. I think that's also true for adults, based on my own personal experience with kohlrabi. At first I only liked it in sushi, where I used it as a cucumber substitute--like my Egg, Carrot, and Kohlrabi Sushi or my Spam Musubi Chirashi Sushi. Then I thought of other ways I use cucumbers, and made my Spicy Asian Style Kohlrabi Pickles (which are simply yummy). Taste is subjective, however. No matter how many exposures you have to it, if cilantro tastes like soap to you, you're not going to come around. I think the level of spiciness in a dish is a similar concern. If you don't care for a spicy pickle, you just don't care for a spicy pickle! [Me, I'm not a fan of bread & butter pickles. They're just . . . wrong. But you do you.] 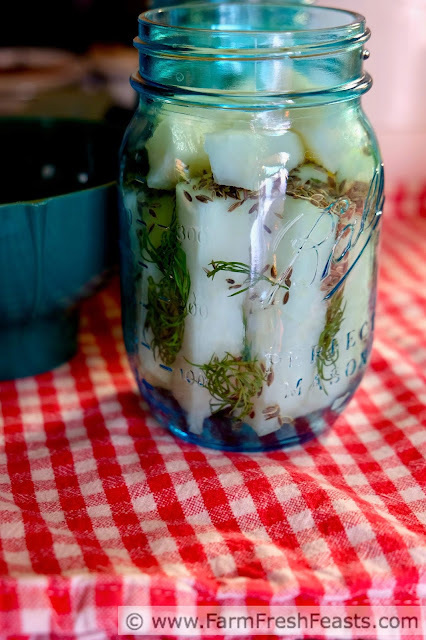 That's why I'm sharing this recipe for a kosher style dill pickle made with kohlrabi spears instead of pickling cucumbers. 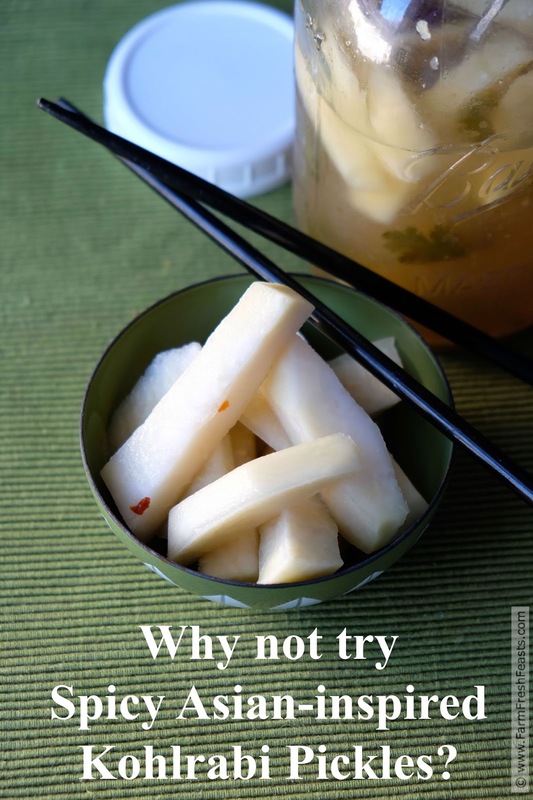 For more recipes using kohlrabi, please see my Kohlrabi Recipes Collection. It's part of the Visual Recipe Index by Ingredient, a resource for folks like me eating from the farm share, the farmer's market, the garden, the neighbor's garden, and great deals on ugly produce at the grocery store. Note: I've shared boiling water bath canning directions for this pickle because that's how I made it. If you'd prefer to make a quick refrigerator pickle (quick being subjective--they are quick to assemble but take a week or ideally two to cure in the fridge) please feel free to make quick pickles. Just stick the filled jars into the fridge instead of processing them in boiling water. If boiling water bath canning, wash 2 pint jars and have them simmering in your canning pot. Make sure you've got rings and the proper size lids. If you're making quick pickles, just wash the jars. In a medium saucepan, bring vinegar, water, and pickling salt to a boil. 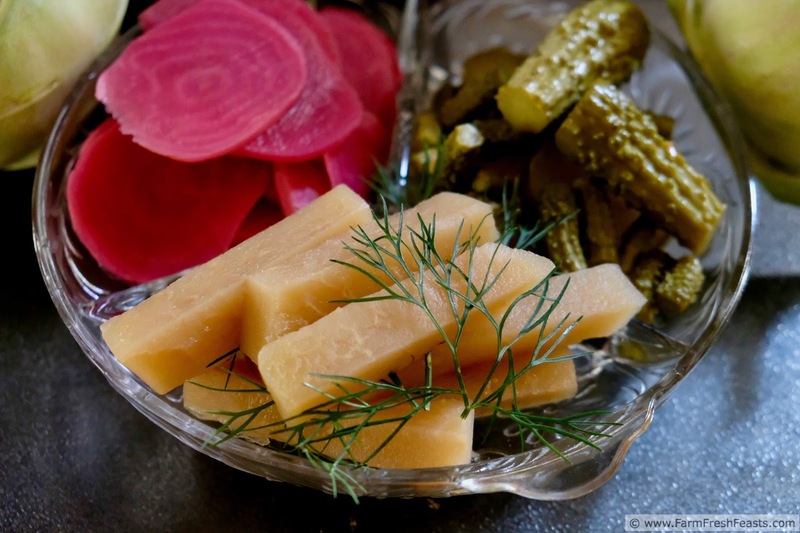 While you're waiting for the brine to boil, tightly pack each jar with kohlrabi spears. I find it easiest to lay the jar on its side to start. Add dill and garlic to the jars, dividing equally between the 2 jars. Use a chopstick to tamp down dill in between kohlrabi spears if needed. When the brine is boiling, pour it into the jars, filling to ½ inch below the top. You will have extra brine. Use it on my Asian-inspired kohlrabi pickles, or cukes, or peppers, or beets? If you're making quick pickles, transfer to the fridge when cool, and let cure for a week or, better, two before eating. If you're processing these for shelf stability, wipe the rim of the jar with a damp towel. Apply a lid and ring, tightening the ring until it's just tight. Don't crank on it. Transfer to canning pot. When the water returns to a boil start timing and process for 10 minutes. Turn off heat and transfer jars to a towel-lined counter where they can rest undisturbed until cool. Listen for the ping! Once cool, remove the rings and lift the jars up by the lid. If you can, the jar is sealed. If the lid comes off, use a plastic cap and refrigerate the pickles as with quick pickles. Give them a week or two to cure, then enjoy. This is a great idea! 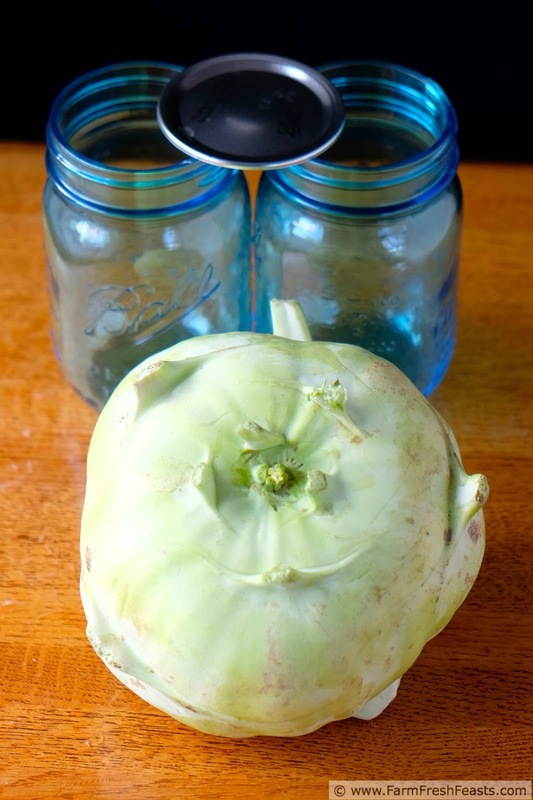 Our CSA always has lots of kohlrabi, and I never know what to do with it. 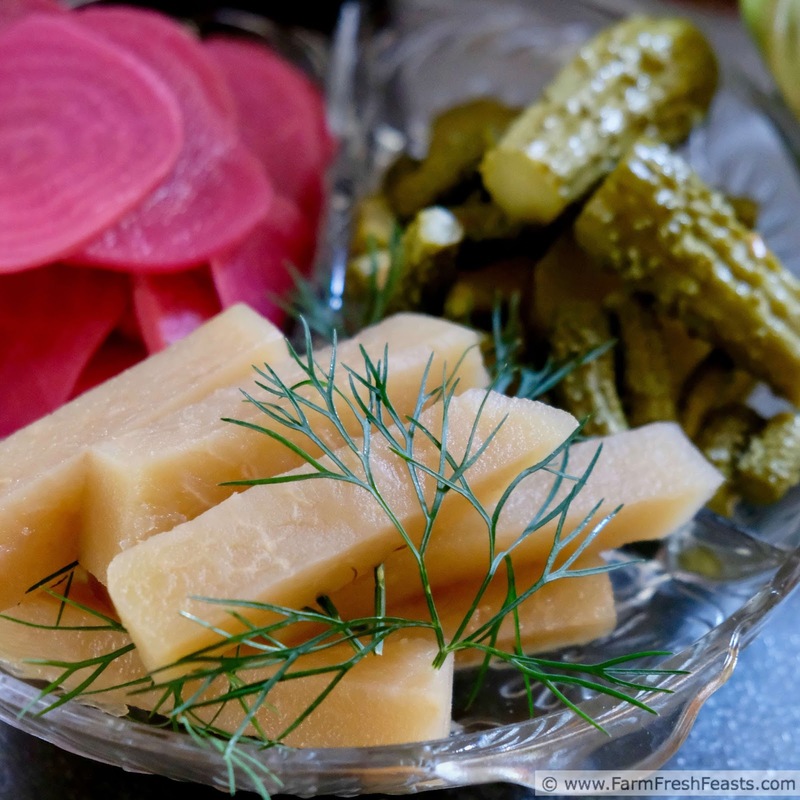 It's definitely not our favorite, but we love pickles, so I will try this later on this summer! What a great idea. Way to think outside the box, or should I say jar? So interesting! I've never tried pickled kohlrabi before but it seems so similar to cabbage that I can't imagine it would be bad in any sense of the word! Definitely want to try this recipe next time I pickle. Thanks for sharing!